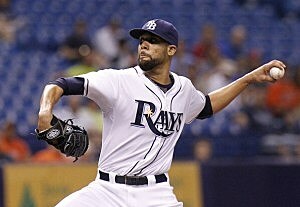 The Detroit Tigers made a big move at today’s trade deadline acquiring Tampa Bay Rays starting pitcher David Price. The Tigers gave up outfielder Austin Jackson and starting pitcher Drew Smyly in the 3-team trade. The Seattle Mariners are the third team in the trade. The Mariners get Austin Jackson. The Rays receive Drew Smyly from the Tigers, plus infielder Nick Franklin from the Rays. David Price was the first overall selection in the 2007 draft. He is a 4-time All-Star and won the Cy Young Award in 2012. His 189 strikeouts leads MLB this season. See David Price’s career statistics. The trade gives the Detroit Tigers the American League’s last three Cy Young winners in their pitching rotation: Justin Verlander (2011), David Price (2012), Max Scherzer (2013). The trade could mean that Max Scherzer will not be back with the Tigers next season, but the Tigers’ front office is never short on surprises. The trade happened during the Tigers’ game this afternoon and Austin Jackson was immediately taken out of the game. See the mid-game substitution below.